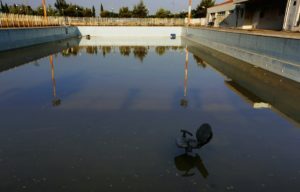 Why are the Summer Olympics held in countries deeply in debt? 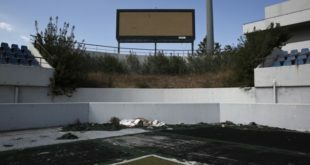 A few years ago there was a great article by Mark Byrnes in The Atlantic who wrote about the aftermath of the $15 Billion (USD) spent by the bankrupt country of Greece on the Summer Games in Athens that took place on 2004. 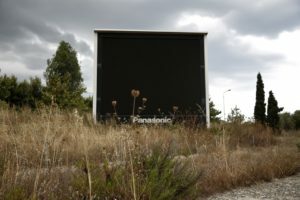 It featured some photographs of the abandoned structures used at the Games that cost the Greek citizens $15 billion dollars they did not even have. Rio 2016 organizers say they hope Vinicius will help them raise 1 billion reals ($398 million) in merchandising. Which is all well and good until you realize that so far Brazil has spent well in excess of $7 Billion (USD) that they also do not have. Much more will be spent. 86,000 soldiers and policemen will be deployed to cut down on the frequency of terrorist attacks on the huge crowds. And by now you should have seen the horrid, festering, refuse-filled waterways to be used as venues for the acquatic events. As bad as the preparations were for the Athens games, the President of the IOC has called these the “worst ever”. This did not stop Moody’s giving the Games their blessing. Without making a call about Zika, Moody’s analysts led by Barbara Mattos wrote that more retail activity and tourists spending with foreign currencies should benefit Cielo SA, Brazil’s largest card-payment processor. Localiza Rent a Car SA, the official car rental company of the Games, and Latam Airlines Group SA, official airline of International Olympic Committee members, also stand to gain. More lasting benefits will accrue to the Rio de Janeiro metropolitan area, where the events will take place, Moody’s said. Not including sports facilities, the city has gotten about about 25 billion reais ($7.1 billion) in infrastructure investment — toll roads, ports, other projects — as a result of the Olympic preparations. <Editor’s Note: “has gotten”, I assume, means “spent by the State”> The Olympic legacy will also include a key subway expansion and a tramway project from domestic airport Santos Dumont, all of which could make the city a more efficient place to do business, Moody’s said. Brazil is in the midst of a crushing recession and political upheaval that led to the removal of Dilma Rousseff from the presidency three months before the start of the Games. 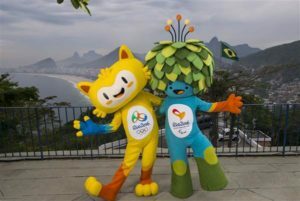 Moody’s said the Olympics are neutral for Brazil’s sovereign credit quality, and Brazil’s economy is still set to contract 3.7 percent this year. One of Brazil’s biggest newspapers, O Estado de S. Paulo, reported on Friday, citing an interview with the minister, that the government had suspended housing program Minha Casa Minha Vida during a 40-day review. Shares of MRV Engenharia SA (SA:MRVE3), the biggest homebuilder in the low-income housing program, dropped nearly 8 percent in early trading before paring losses to 1 percent as the minister waved away concerns. The health minister also said the size of the public health system had to be reassessed, before retracting his comments. His peer in the education ministry said he supported monthly fees for post-graduate courses at federal universities, but then guaranteed that all public universities would remain free. Geddel Vieira Lima, the secretary of the government, acknowledged on Tuesday that some policy considerations “were being transmitted to society in the wrong way,” asking journalists for “patience” amid the transition. I suppose they could get Sen. Bernie Sanders down there to straighten things out and keep everything free. State-owned oil company Petrobras is reeling under it’s own scandals, amid the current woeful state of the petroleum industry. Ethanol production, once hailed as Brazil’s miracle, has helped decimate the sugar industry. We, the 31 Olympians who tested positive for doping, completely agree that we should be banned from the 2016 Rio de Janeiro Games. Prohibiting us from going to the country where the Zika virus is thriving will definitely teach us a lesson. We will absolutely consider this a punishment and not see it as a stroke of good fortune that could save our health and the health of our future children. Doping is a serious violation, and taking the Olympics away from us is a serious punishment. We have dedicated our lives to competing in the Olympics. We train hard all day, everyday. It is all we know. But if banned from Rio, we’d have to stop training. All of a sudden, we would have to sleep late, not lift weights for 7 hours a day, and eat as much ice cream as we want without consulting a nutritionist. What a drastic change! We wish we could turn back time and make better choices. We definitely do not see doping as the ticket to the only rest we have had since we were small children and a coach noticed our potential. Nope, it’s a punishment, for sure, for sure. Our fate is in your hands, International Olympic Committee. Teach us a lesson by sparing us from the 2016 Rio de Janeiro Games. Happy Saturday. Smoke ’em if you got’em.